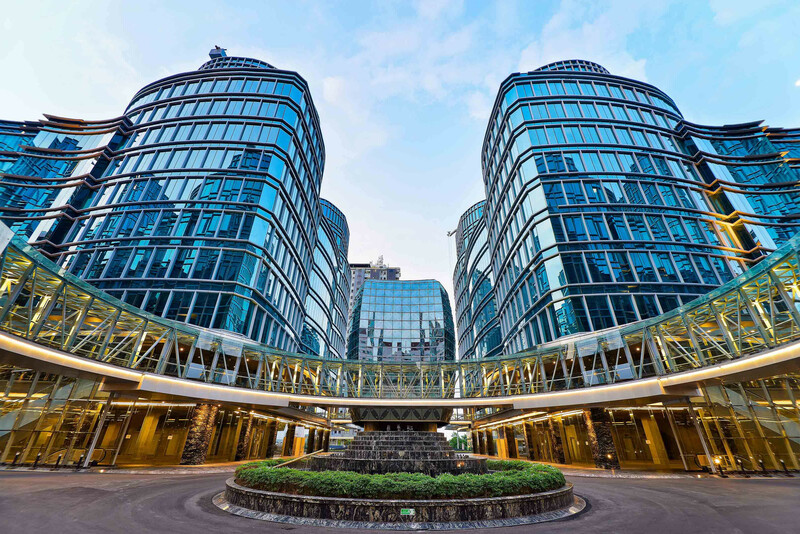 Located in central business district around pluit, near the harbour, Landmark Pluit transforms common shophousing complex into Urban Office Park. Car parking area submerged into basement level, to create spacious ground floor area for pedestrians and public spaces. As to facilitate our pedestrian access, public bus stop connected directly in the same ground floor, which has alfresco facilities to support the business district, and completed with glass bridges & open corridor to connect each 4 mass buildings. Meanwhile the access for private car and helipad are also available and easy. Right in the middle of 4 massing, designed a recreation center covered in glass facade in batik patterns. The ingenuity of locality is found not only in batik pattern, but also in entire facade which is wavy as to reflects the history of the past as Batavia old harbour in North Jakarta. As a final touch, a water fountain surrounded by void spaces created easy air circulation between basement to the ground level, making a business district, Landmark Pluit as center of attraction, thus can add more value in local district.